Surely a princess look you will have in this flaring pink flower girl dress. Wide one shoulder bodice is dyed with floral prints and flattered by pink 3D flowers, which is beautifully extended to the organza one top layer skirt. The pink tulle made skirt is adorable cupcake style. Hidden zipper closure back. This pink tulle cupcake flower girl dress is enchanting for garden or outdoor wedding. Category: Flower Girl Dresses. Tags: 3D flowers, cupcake skirt, floral prints, one shoulder, Organza, pink tulle. 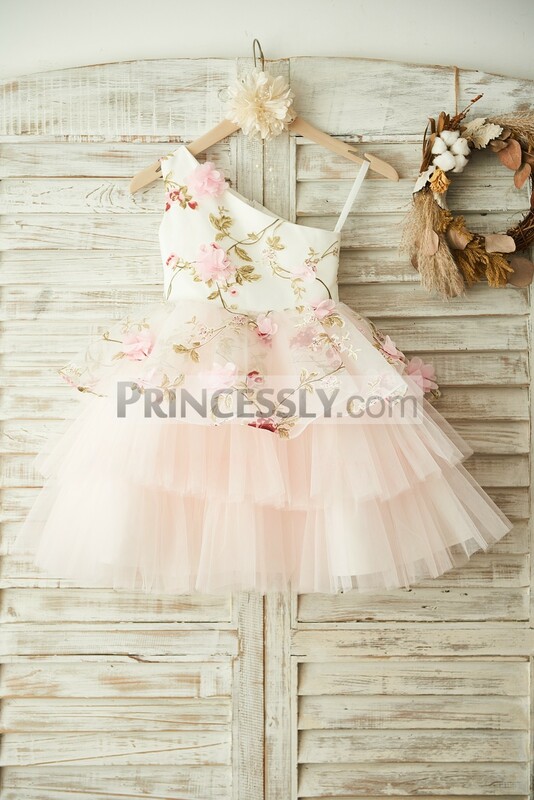 Surely a princess look you will have in this flaring pink flower girl dress. Wide one shoulder bodice is dyed with floral prints and flattered by pink 3D flowers, which is beautifully extended to the organza one top layer skirt. The pink tulle made skirt is adorable cupcake style. Hidden zipper closure back. This pink wedding flower girl dress is enchanting for garden or outdoor wedding. Be the first to review “One Shoulder Floral Organza 3D Flowers Cupcake Wedding Baby Girl Dress” Click here to cancel reply.